This simple salad has sweet, salty and savoury flavours and plenty of wow. To make the vinaigrette, whisk together the lemon juice, olive oil and salt and pepper. Put the rocket and mint in a bowl, add the vinaigrette and toss to combine. Heat the olive oil in a nonstick frying pan over high heat. Pan-fry the halloumi for 1 minute on each side or until golden. Divide the salad and halloumi among four serving plates. 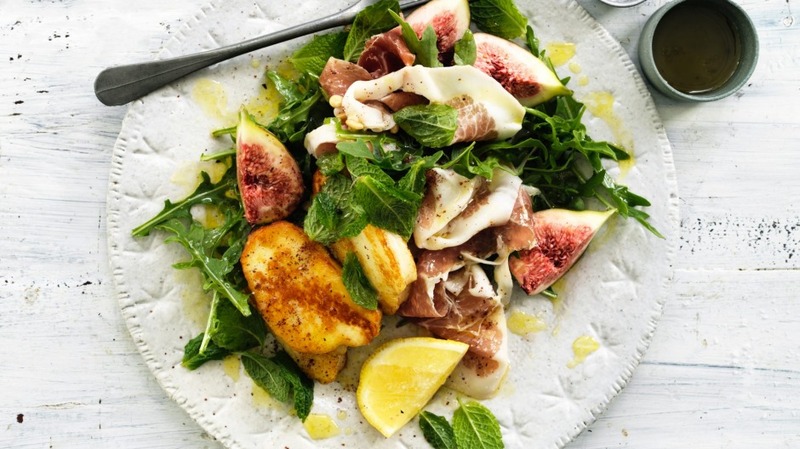 Place 2 pieces of prosciutto on each plate, then one quartered fig on top. Sprinkle with pine nuts and finish with sumac. Serve immediately.